Today is the official launch of our NEW ONLINE STORE! We have been busy behind the scenes prepping our launch and building the web store. There was no blood, maybe a little sweat (I accidently deleted items a time or two) and one or two tears of pure joy when I finally could say I was finished! We were hearing from many of our customers and friends that they loved our store, and didn’t have a local yarn store in their town. So with the intention of creating a bigger community and supporting makers in what ever community they live in to have access to yarns of canada and the world.. We look forward to being able to support you on your journey of creating! 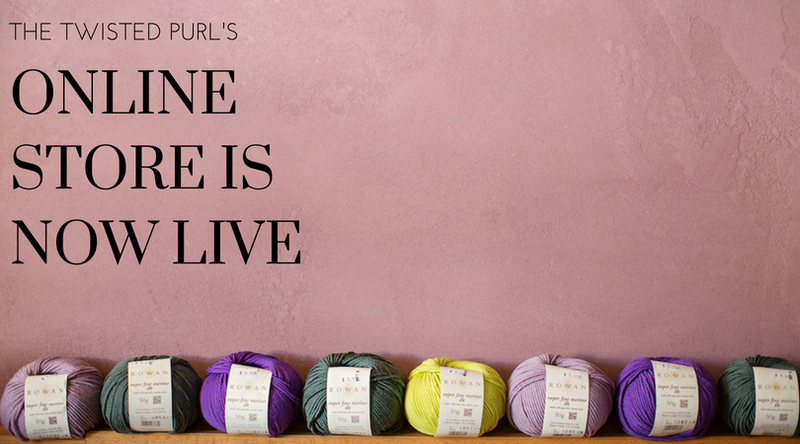 We will have an official party celebrating our 3rd anniversary as well as the launch of our website on August 18th, join us at The Twisted Purl for cake, conversation and all the good things. Our store is filled with wonderful creative options from home and around the world, and we are so happy to be celebrating another year together. We have great amazing women and men who stop in the store each week to share their stories of who they are creating for. Our knitting groups have all turned into a great group of friends who we look forward to seeing each week. And although you may live away and be sitting reading our newsletters in the comfort of your home in another town, we hope that you can feel more connected to seeing what we share and make each week and now have the ease of purchasing and knitting along with us on future projects.